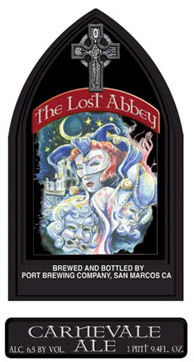 From Lost Abbey: The brewery in San Marcos, Calif., will celebrate a Venetian tradition with a New World twist, throwing a party and at the same time releasing a new beer. Carnevale di Lost Abbey on Feb. 2 draws inspiration from Carnevale di Venezia, during which citizens of Venice dress up as paupers, princes, ladies, lovers and fools, and gather in the Piazza di San Marco to dine, drink and dance. Lost Abbey will transform its brewery into a Venetian piazza, offering party-goers food, music and Lost Abbey’s award-winning ales. The party starts a 6 p.m. Admission is free for those in costume, $10 for those not. Carnevale ale, a blonde saison accented with American hops, will debut at the party. From Full Sail: The Oregon brewery is rolling out Slipknot Imperial IPA (7.8% abv, 80 IBU) this month as part of its Brewmaster Reserve series. It follows with Top Sail Bourbon Barrel Aged Imperial Porter in February, continuing its vintage barrel aged series. Full Sail will celebrate three years of aging beers in bourbon barrels by pouring all three at events Feb. 7. That will include the bourbon-barrel-aged 2004 Imperial Porter, barrel-aged 2006 Black Gold Imperial Stout and this year’s 9/85% barrel-aged Top Sail Imperial Porter. The special tapping will take place at 5 p.m. at the Full Sail Tasting Room and Pub in Hood River, and at Full Sail’s Riverplace Brewery in Portland.